Manufacturing’s vital contributions to the California economy are far out of proportion to its shrinking share of employment. California’s manufacturing sector boasts $87k average wages (2017), more than $288 billion in output (2017), a higher share of workers without a college degree than economy overall, and tremendous economic ripple effects from long supply chains and economic activity. California is still the largest manufacturing state in the country with more than 1.3 million workers but given the state’s size, that doesn’t tell the whole story. With all of the benefits California reaps from manufacturing, it remains that the state simply is not keeping pace with the national resurgence. This is evident in California manufacturing job growth, investment growth and reshores as a percentage of the the rest of the country. 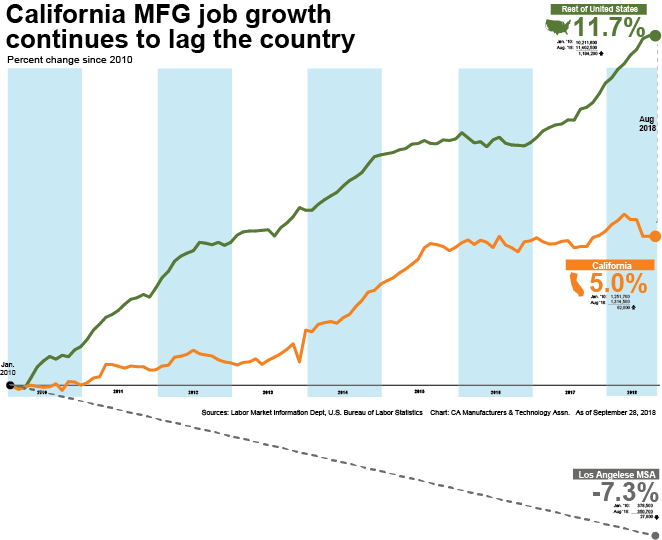 Manufacturing job growth in particular shows a 5 percent increase since 2010 in California, while the country grew at more than 11 percent. Further some of the regions that need manufacturing opportunities the most are seeing dismal manufacturing growth rates (See L.A. in chart). We simply can and must do better. Costs and predicability are often the largest challenges for manufacturers to make long-term investment decisions in California. Electricity rates alone are 86 percent higher for the industrial class and 49 percent higher for the commercial class. Workers' compensation premiums are the highest in the nation. California-specific laws that pop up every year often make it difficult to understand if a manufacturer can compete long-term in the state. These challenges and more have created an environment that makes it difficult for California’s robust innovation and R&D to scale up actual manufacturing facilities in the state. 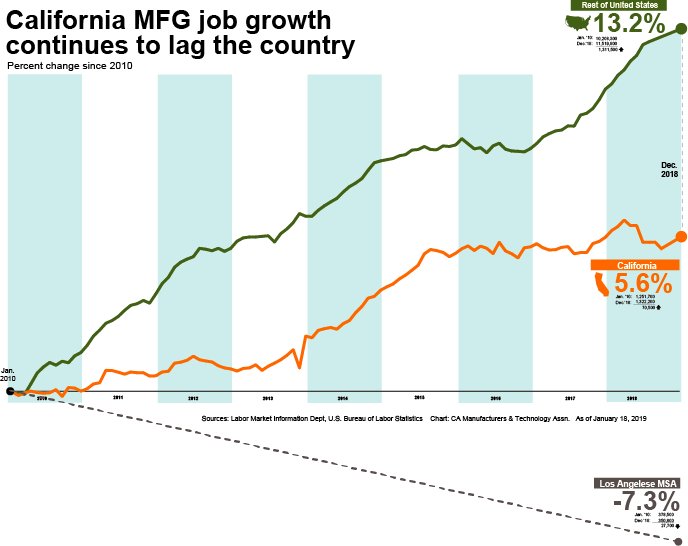 CMTA continues to present these facts to the Legislature and the media and we hope you can join us in telling the tremendous story of manufacturing benefits and opportunities, as well as the challenges of competing in California. Below is an updated chart of manufacturing growth, with the percentage for the state's largest manufacturing region -- LA -- included. Los Angeles County has historically been the industrial powerhouse for the state of California. Workers in transportation equipment, apparel, fabricated metal products, computers and electronics earn middle class or better salaries with upward mobility to achieve their career goals. 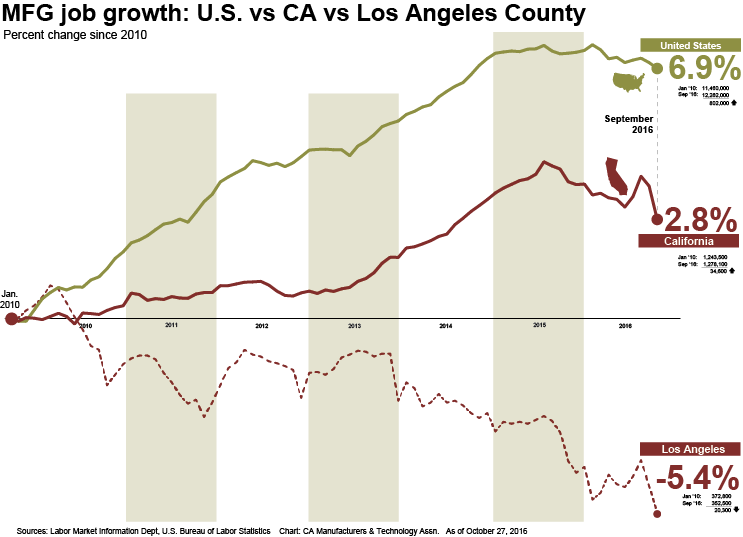 So it is alarming that LA County manufacturing jobs are being lost while other California locations and the US as a whole is growing since the end of the recession in 2010. Before and during the recession the losses were already accumulating in LA County with a 34 percent loss in manufacturing jobs from 2000 to 2009. Now as the rest of the country rebounds with post-recession manufacturing growth, the county continues its slide with a 5.4 percent loss in manufacturing jobs since 2010. It is possible that the shift away from manufacturing is making room for other service jobs in the area. But do those jobs have the same wages, benefits and opportunity for advancement? Do they provide middle class status for workers without four year college degrees? Local leaders should analyze and understand how the loss of manufacturing jobs will impact citizens and related businesses in the region.